A retail cash wrap is an essential part of any store, a providing a space for customers to check-out whilst also offering a look at high end items! 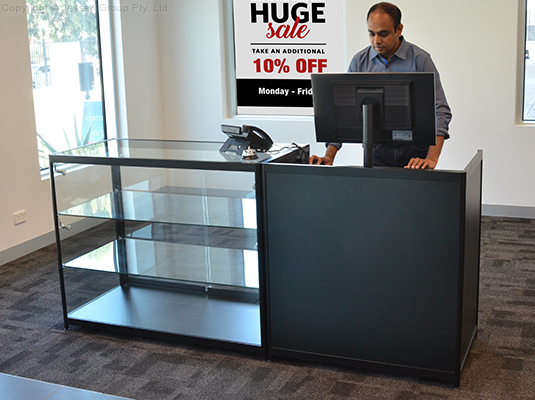 These store merchandise counters have a full vision display case that is 1200 x 600 x 965mm, made of tempered glass to provide a durable and safe display that holds up well to regular use in a variety of location. The countertop is also made from glass, providing a top view of items whilst still able to support promotional signage, product demonstrations, and conduct transactions. The freestanding store display, retail cash wrap is a lockable display, with sliding doors have a lock that prevents theft by allowing easy access only key holders. The tiered display has (2) tempered glass shelves that split the case into three levels each supporting up to 40kg, with the bottom MDF level able to support ample weight as well. There are (4) LED lights that are adjustable for the top two tiers, illuminating the case and allowing for spotlighting of specific products to better draw attention. The cash register stand has a lockable drawer for holding a cash tray or valuables to keep them safe. The large interior has an adjustable shelf that can be placed in two set positions in order to better hold personal items or merchandise stock of different sizes. The store cashwrap is shipped fully assembled for assurance of proper assembly and to provide buyers a display ready to go out of the box instead of taking up hours of time using complicated instructions for set-up. The aluminim framing on the display case is minimal and has a black matte finish that matches the base and register stand. The feet on each display are adjustable for use on uneven surfaces, making it easy to level the display. Order today for fast shipping Australia-wide from Slimline Warehouse to outfit your shopping center kiosk, retail store, jewelry store, department store, and more!